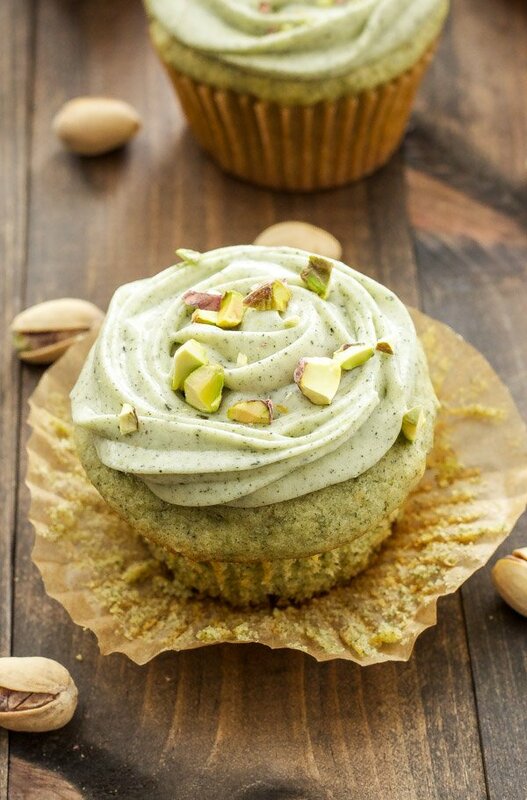 Remember that time I made Pistachio Green Tea Cupcakes with Matcha Cream Cheese Frosting? I must say they were some of the most delicious cupcakes I ever made! 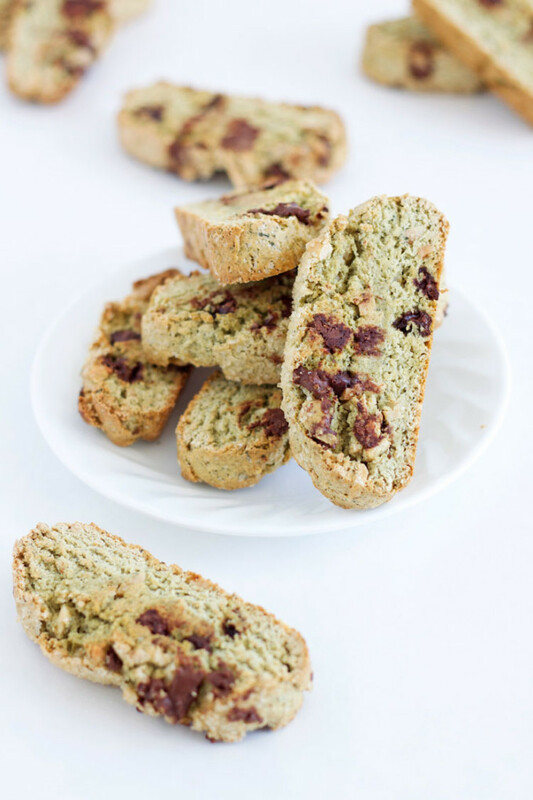 Ever since making them I’ve had a hankering to make some more green tea inspired treats. Something I have yet to share with you guys is a recipe for crepes. So what better way to blend the two together than to make a recipe for Matcha Green Tea Crepes with Matcha Ricotta Filling! I love crepes! 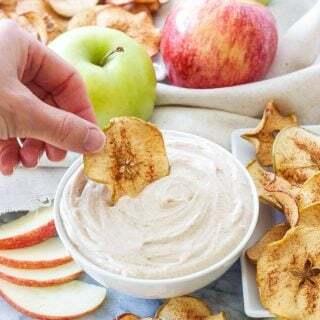 I love how thin and delicate they are, I love that you can make them sweet or savory, and I love that they are perfect any time of the day. 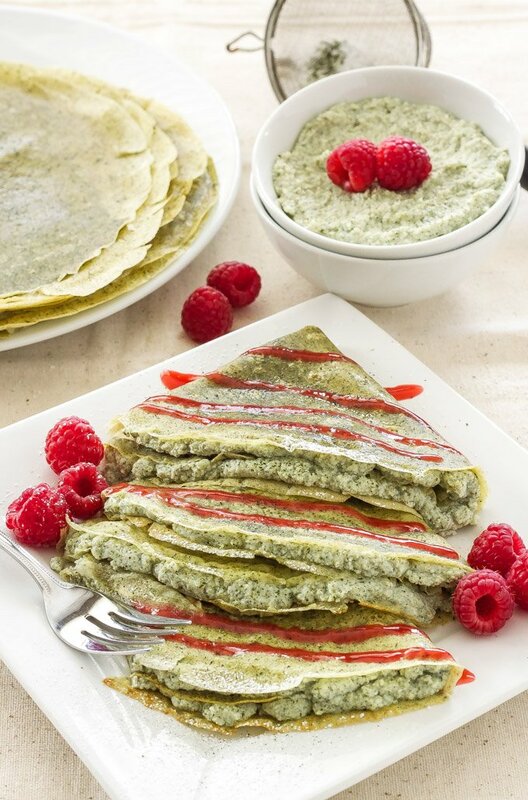 These green tea, aka, matcha crepes can pass for both breakfast or dessert. They are a sweet crepe, but not so sweet you’ll be on a sugar high the rest of the morning. 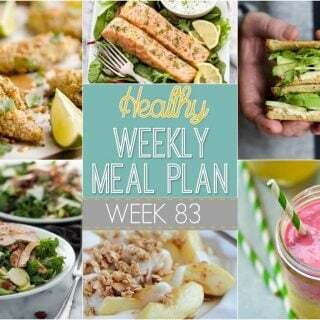 The crepe itself is made up of a combination or whole wheat pastry flour and all purpose flour with a generous tablespoon of matcha powder added in. 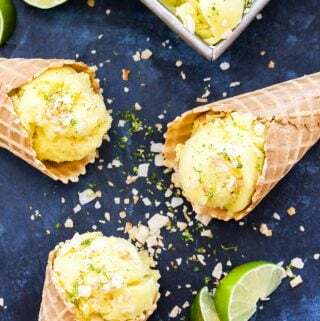 The crepes have a prominent green tea flavor, so if you like that, you will find yourself snacking on them before you even get to the filling part. If you love the benefits of green tea, but prefer it in a more subtle form, that’s where the ricotta filling and raspberry sauce come into play. The ricotta filling is simply part skim ricotta cheese, honey, 2 teaspoons of matcha powder, and vanilla extract. Depending on how strong of a matcha flavor you are looking for feeling free to reduce the amount or add more of the matcha. The amount I used isn’t overpowering, but you definitely get some of that earthy flavor. The honey and vanilla added to it give the filling a subtle sweetness without making it so sweet your teeth hurt. 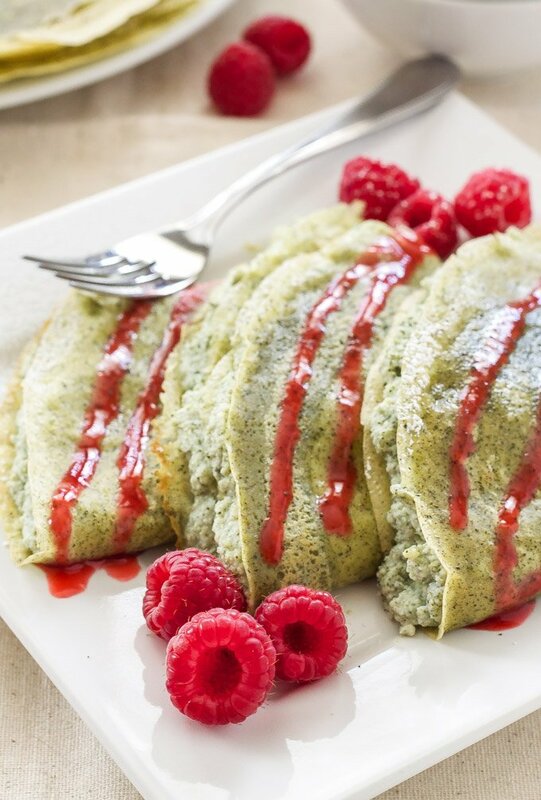 The final part of these green tea crepes is the raspberry sauce. It may have been my favorite part too. You might think about skipping this step, but don’t! There is something so delicious about the pairing of raspberry and green tea. 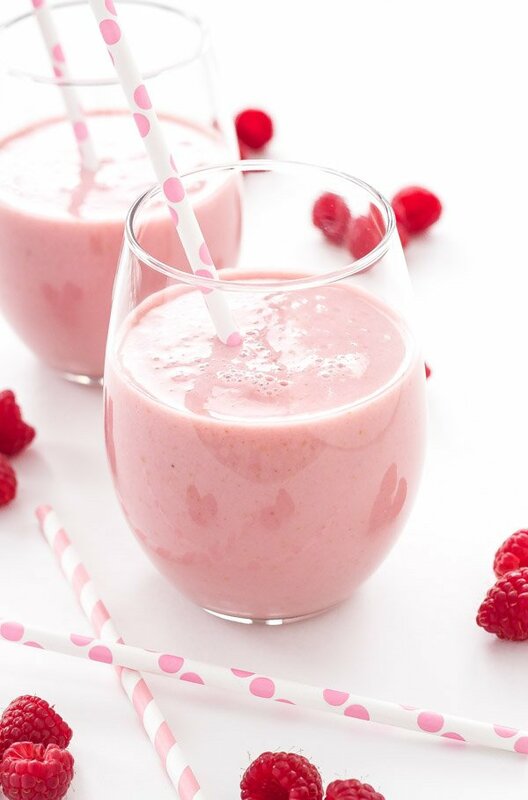 The sweet slightly tart flavor of the raspberries paired with the earthy flavors of the crepes is the perfect balance. Like I said, if a pronounced green tea flavor isn’t your thing, the raspberry sauce helps to balance out the flavors. These crepes would be perfect served at a brunch (Mother’s Day is just around the corner), a bridal or baby shower, or as a light dessert after dinner. 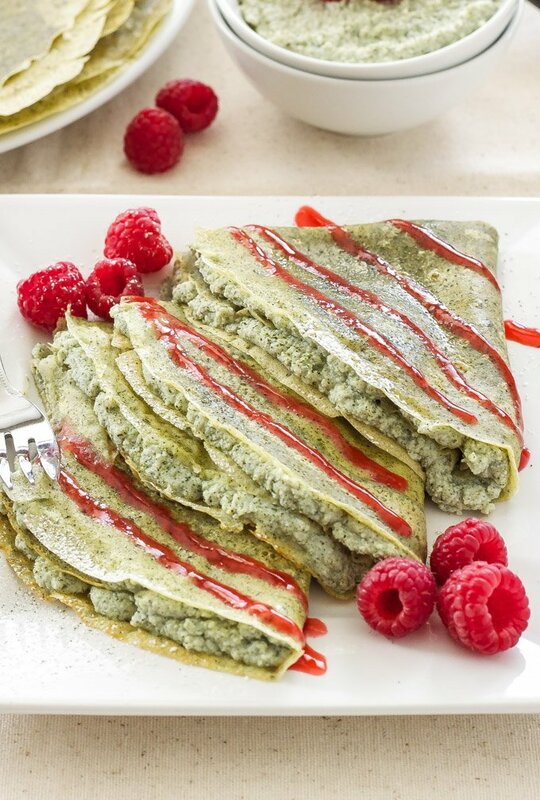 If you are looking for unique and delicious ways to incorporate more green tea into your life then you should definitely give these crepes a try! 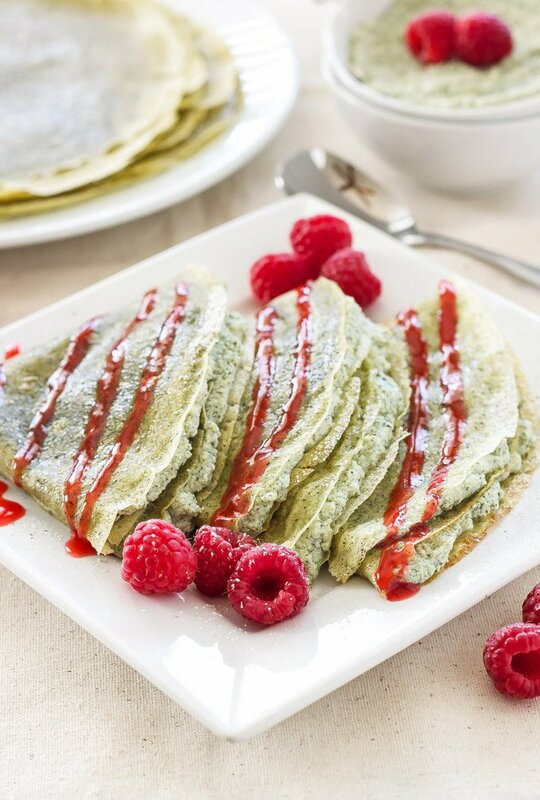 Delicious thin crepes infused with green tea powder, filled with a light matcha ricotta filling, and topped with sweet raspberry sauce. These crepes are perfect for brunch or dessert! These look amazing! I bet the matcha and raspberry sauce make a great combination. I've been wanting to try making crepes, you've definitely motivated and inspired me! Thanks Miranda! I love making crepes. They take a little time, but making them is kind of relaxing, plus they taste fantastic! Thanks girly! Let's have a crepe party when you get your new house! I am loving all that matcha recipes I'm seeing around lately - and these crepes are no exception. Who knew that matcha, ricotta and raspberry could go together so well! Thanks Thalia! It's a great combination!